Did you know that the Best Bamboo slats are capable of withstanding harsh weather conditions and have a higher tensile strenght than steel? Our bamboo slats are so versatile you have endless possibilities for improving and/or adding beauty to your home. Other uses of the bamboo slats are the elaboration of wall coverings, fences, floors, furniture, accessories, handicrafts, and even bamboo panels used in prefabricated constructions!. Our rectangular Bamboo Slats, 2-5 cm in width and various lengths are made from the bamboo specie: Guadua Angustifolia. We immunize with a Boron treatment and when required we can even have them Class A fire rated! Bamboo slats have been used to create bamboo fences and privacy screens for a long time. Our bamboo fences are used for fencing, privacy screens for your deck or any other decorative purpose where a tropical theme is needed. Our bamboo fences come in different sizes and are considered as an option for separating portions of gardens into various parts. Our No-Climb fencing options provide privacy and security, along with rich visual texture. 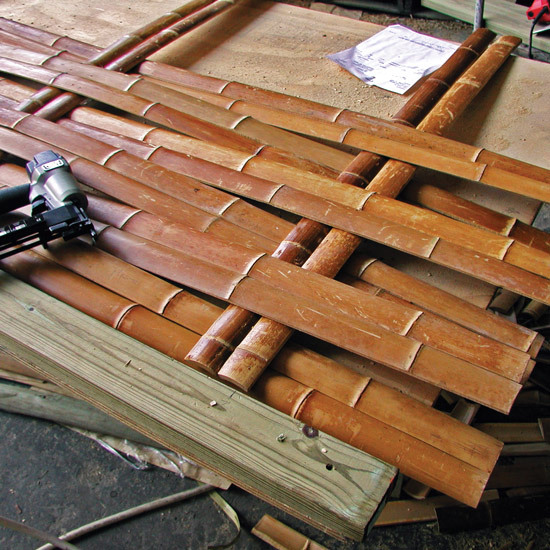 Three horizontal bamboo rails are woven with flat bamboo molding to create a tightly packed wall of bamboo. The narrow slats provide very little toe-hold, meaning fences are very difficult to climb – the slick waxy skin of the bamboo, even more so. Appearance: Pale blond bamboo molding woven vertically through three horizontal bamboo. Fire Protection: Thanks to Safari’s break-through fire-protection treatment for bamboo, we are able to offer the first ever Class-A fire rating on bamboo that is not simply a topical treatment that can be wiped away. Fire rating options are not standard, so inquire with your sales rep, if fire retardant is a need in your project. Durability: Long lasting fencing material, but needs to maintained annually to prevent natural silvering over time. Size: 6′ high x 8ft wide. Custom sizes possible. Ease of Installation: Simply fix via lag screw to new or existing fence posts, that are installed every 4′ (or even 8′ if allowed by code in your region). Bamboo fencing will need to be treated to prevent decay and weathering. It is recommended that you apply a thin coat of UV resistant stain to your bamboo fencing and bamboo gates to protect the bamboo from the weathering effects of your climate. They are just like wooden fencing; they age and fade, but last for years. If you would like a quote on our Best Bamboo Slats, Bamboo Fences & Privacy Screens for sale, please fill the form bellow and a Best Bamboo representative will contact you within 24 hours.